“Missoula” was an intriguing, strange name I first saw on a hotel towel when I was about 13 years old. It seems a gold miner had stayed at the Missoula Hotel before camping out on the Big Horn River in Wyoming where I lived a rather primitive life with my 7 brothers and 1 sister. I graduated from Lovell High School in 1941 after attending grade school at Kane, Wyoming, now under the waters of the Yellowtail Dam. During my freshman year at the University of Wyoming I had an opportunity to spend the summer fighting forest fires with a “hot shot” fire crew in Montana. Twenty states and thirty four colleges were represented at the old Civilian Conservation Corps Camp near the Nine Mile Ranger Station. My summer in Montana proved to be a long one, 1942 – present and still counting. I liked Missoula so in the fall of 1942, I enrolled my sophomore year at the University of Montana. I had broken my arm in Devils Canyon when I was 7 years old and due to the 9 mile horseback ride home some complications caused my right arm to heal at a rather peculiar angle. It kept me from joining the army after Pearl Harbor so I spent the next 2 1/2 years working for the Forest Service and going to college. I was finally accepted in the army in October 1944. I was trained for the Field Artillery at Fort Sill Oklahoma. I then spent 2 years in France, Germany, Austria and a college course at Shrivenham American University in Swindon, England. I had flunked physics under Dr. Shellenberger while at the University of Montana. Dr. Shellenberger was tough on Forestry majors because physics was a required subject and we were not taking it by choice. I had signed up for physics at S.A.U. thinking that I could get my required credit before returning to the University of Montana. Shrivenham American University was staffed by professors from colleges all over the United States. And guess who was teaching physics, Dr. Shellenberger from Missoula. I returned to Missoula in October 1946 and worked for the Highlander Brewery before going back to college. I never did finish my senior year. I met Margie Trucano in 1947 in Missoula where she was attending Nursing School at St. Patricks School of Nursing. 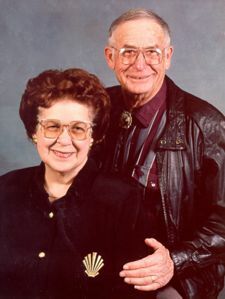 We were married May 22, 1948. We spent the next 8 years moving from place to place while I worked for the Bureau of Public Roads. Our oldest daughter, Kathy Jo, was born March 20, 1951 in Missoula and Julie Ann was born December 12, 1953, also in Missoula. In 1956 Kathy was about ready to start school so we decided to settle down in Missoula. We had lived in a 26′ Spartan trailer while roaming around Montana and Idaho and realized that Missoula needed a mobile home park. El-Mar Trailer Village was named by combining our two names. We started with 56 spaces and parked our first trailer in July 1956. It was tough the first few years so I worked on engineering jobs at Hall, Montana and Jackson, Wyoming to supplement our income. Our youngest daughter, Laureen Kay, was born October 26, 1959 in Missoula. It was in 1965 that Margie and I bought more land, built more mobile home spaces and began developing campsites for people traveling around the country with R.V’s and tents. 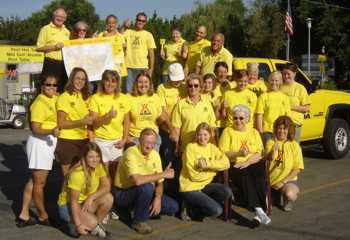 In 1967 we bought a KOA franchise and were on our way to the present 200+ camp sites. 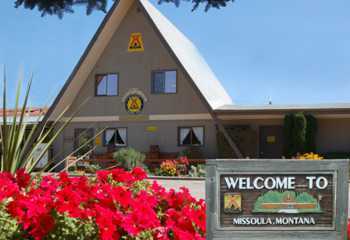 The Missoula/El-Mar KOA has become one of the larger KOA’s in the system. Many incidents have kept our life interesting since Margie and I started parking campers. We ran the campground ourselves at first but found the need to hire help about 1970. 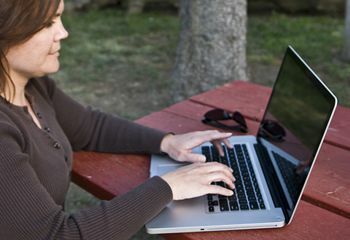 We presently have 30 employees during the summer season with about 10 year-round full-time employees. 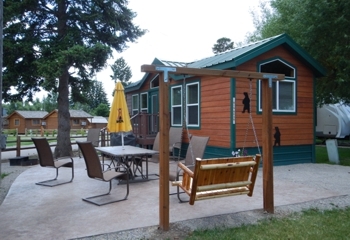 Our KOA is built on land that has historical significance as we learned by reading our abstract for deed. 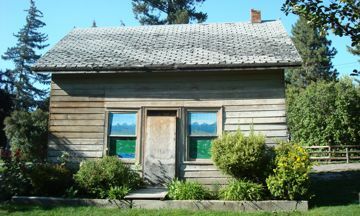 There was an old farm house and a large fir tree in the center of the property. 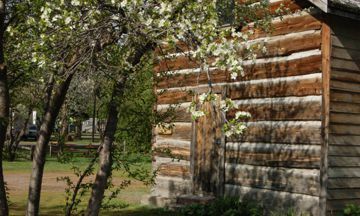 There was also a cherry tree, an apple tree and several small fir trees surrounding the house. There are now over 600 trees in the 30 acres. The farm house was not functional due to the many rooms, each with different heating stoves; propane in one bedroom, a wood range in the kitchen, oil in the living room, electric heat in one bathroom and a large fireplace. The house sat empty from 1965 until 1987 except for one winter when we let some college students stay in it. 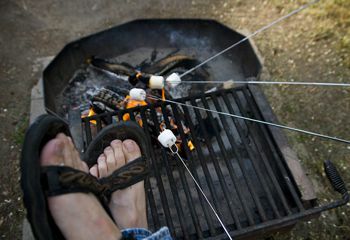 They literally “camped out” around the fireplace and cooked on the old Majestic range in the kitchen. We knew the house had been only a log cabin at one time, so we decided to tear down the house and see if it might reveal anything. Our first find was a Missoulian newspaper used as wall paper under the stairway dated April 1919. We found square nails in shiplap siding under some wall paper, and sawdust used for insulation. We found a Missoulian dated 1890 in the bedroom closet and one in the bathroom dated July 1921. The west wall of an addition was stacked full of handmade bricks between studs. While loading material our dump truck fell into an old cesspool southwest of the house with rock walls. A second cesspool was found north of the house. We saved all the brick and several types of boards including rough sawn boards 1″ thick and 4″ to 22″ wide, 6″ planed shiplap, 4″ tongue and groove flooring from railway cars. Just outside the door leading upstairs we found a copy of “The Racine Agriculturist” dated November 1882, a Missoulian dated December 29, 1882, a San Francisco Chronical dated December 14, 1882, The New Northwest Deerlodge dated December 22, 1882 and the Butte Miner dated June 10, 1882. Three of these had mailing labels addressed to Nat Coleman. We started taking the house apart February 25, 1987 and finished June 28, 1987. As we were finishing two men stopped to talk with us. They were Vern and Allen Huckaba who were born in the house. Their father, James Huckaba, lived there from 1912 – 1929 when he lost it for taxes. Percy Glasscock bought it in 1929 from the county and sold it to Albert D’Orazi in 1948. We bought it in 1965. 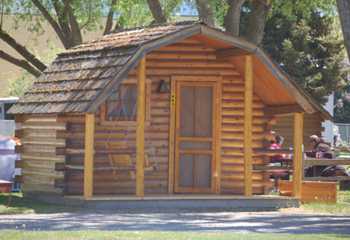 Vern Huckaba told us the cabin was built in the 1860’s as a stage station. The first road through the area went just north of the station. Apparently the cabin was added onto in the early 1880’s by Nat Coleman who lived there with his brother Charles E. The Huckabas told us their father put the bricks in the walls to help keep warm but they actually caused cold and frost to travel through the walls. The old cabin still sits in our Tent Area and is a constant conversation piece. 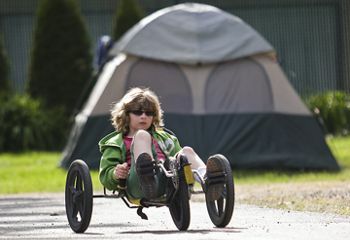 Missoula / El-Mar KOA has won numerous awards as the campground facilities have been expanded. 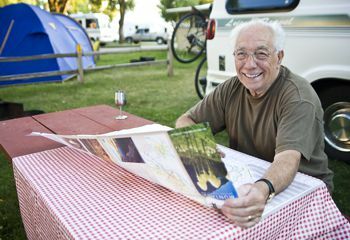 These awards include Campground of the Year, Franchise of the Year, and Award of Merit for Outstanding Service for 15 consecutive years. 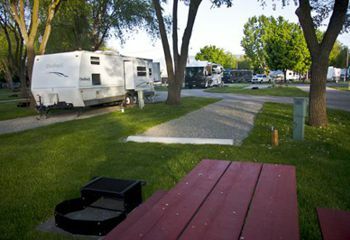 In 1989 KOA Inc. decided to stimulate improvement of the 20 year old campground system buildings and grounds. 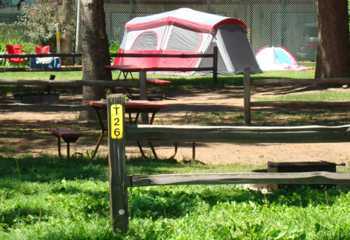 They offered over $30,000 in prizes as an incentive to KOA owners to improve their facilities. 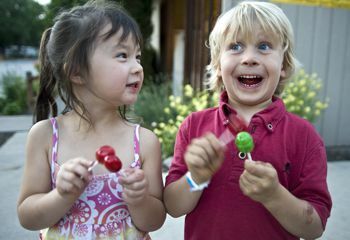 Missoula/El-Mar KOA accepted the challenge and was among 60 applicants in the nationwide Image Contest. On February 13, 1990 our KOA was presented with a new Chevrolet pickup as Grand Prize winner. 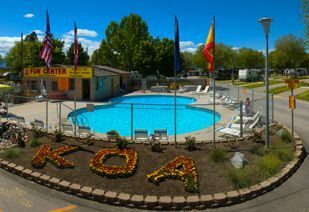 Among the facilities provided by our KOA are Kamping Kabins, full hookup sites, premium RV sites, 2 playgrounds, fun bike rentals, Swimming Pool, Adult Hot tubs, Game Room, Unique Mini-golf, and more! In 2004, Elmer M. Frame, passed away leaving this wonderful legacy to his family. We miss him always and forever!